Pag - a lacy mosaic of nature and culture - Explore Croatia Become a Patron! 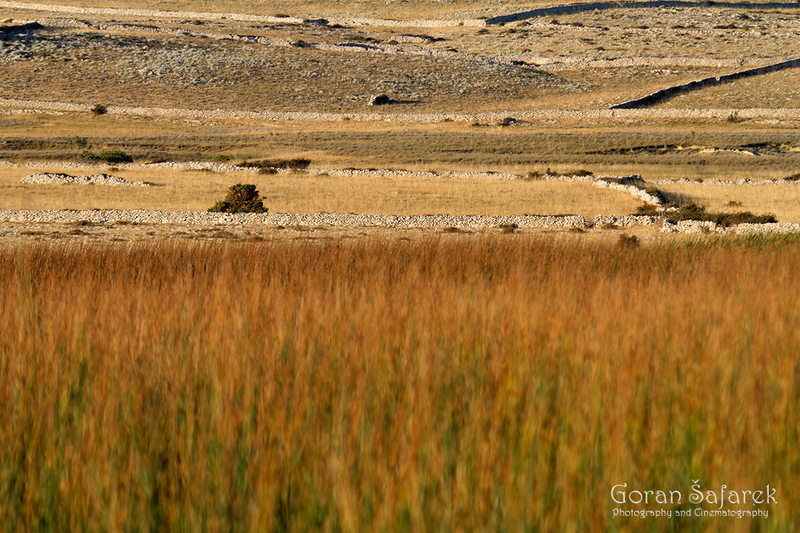 Pag is one of our largest, but also most diversified islands. It is known as the island of salt, cheese and the beautiful Pag lace, although nature has also knitted its own lace into a mosaic with underbrush, mudflats with fresh and brackish water, saltwork basins, vast alcoves, steep cliffs… There are also pastures, vineyards, fields bordered with characteristic rustling reed… The crag of Pag hides much more, many untouched natural treasures, interknitted with a rich cultural heritage into the unforgettable Pag lace in which man and nature are united. 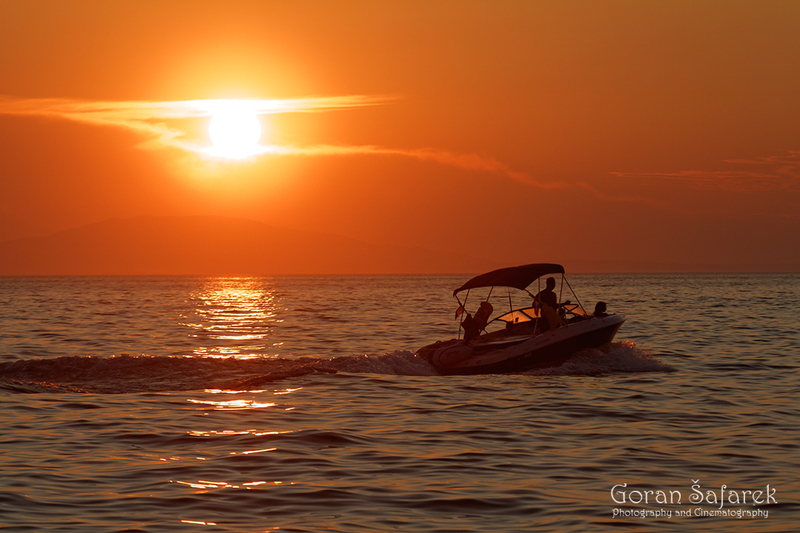 Pag is one of our list of TOP 10 islands in Croatia. Pag is northernmost Dalmatian island, very elongated in shape. It is accessible by a bridge from the south-eastern tip (Zadar region) or ferry from the northwest. The ferry price is 14/17kn per person and 80/96 per car. There are two bigger towns – Pag and Novalja. 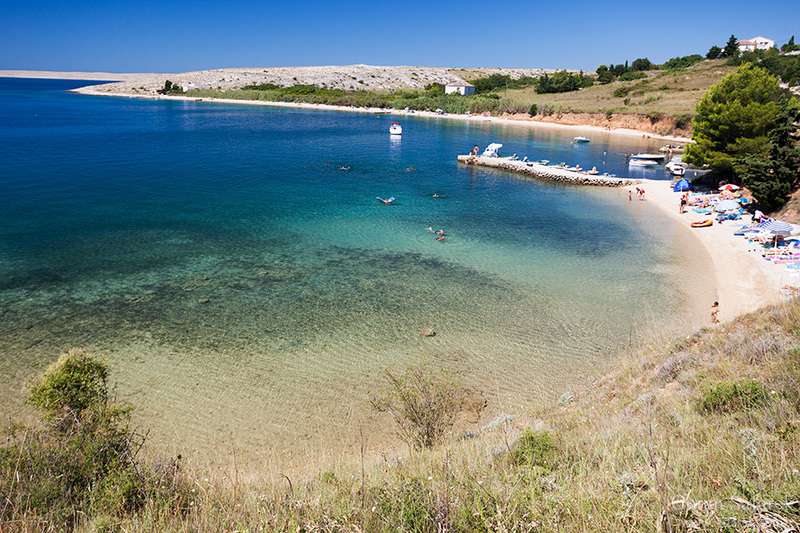 Famous Zrće beach is located near Novalja. There are no big hotels, the majority of the people stays in private accommodation. There are also two big and modern camps – Traško and Šimuni and smaller Sveti duh, that is wilder, for nature lovers oriented, with basic facilities, but more open to nudists and, where rock and reggae music dominates over pop. The most spectacular are the moonlit landscapes of barren rocks on the eastern side of the Island of Pag, facing the mighty Velebit Mountain that overhangs the sea. The Zrće Beach and other tourist attractions are of a newer date, but man has had to, to survive, depend on such a skimpy and sometimes harsh environment. Kilometres of unusually broken and sharp rocks seem to afford no living conditions, blasted by the bora and the merciless sun. It is exactly the bora that storms from Velebit in full swing scourging all in its way. This turbulent wind raises the salt from the foaming waves and carries it far, sometimes as far as the other side of the Island. There are times when the Island’s vegetation seems to have been frozen, but it is, in reality, only covered with salt. This barrenness has largely contributed to the Island’s age-old cattle-breeding, because goat teeth can bite through the toughest of plants. These are today rockeries where tough and hardy plant communities grow, including the endemic coastal prickly Dryps and the Adriatic violet. The rockeries that are less exposed to the teeth of sheep and goats are house to lusher and more colourful pasture vegetation, including more endemic species, such as the buckthorn and Onosma echioides. Along the coast, communities of salt-tolerant plants grow, tolerant of the sea salt carried by the winds. One of the most common salt-tolerant plants is the statice (Limonium cancellatum), which – with its miniscule violet flowers – clutches at coastal rocks like a densely knitted cobweb, while the large yellow flowers of the rare coastal poppy drape the barren gravel. A bit further away from the coast, although still impacted on by the sea salt, communities of endemic Goniolimon dalmaticum reside. This red-flowered plant whose leafs are rosette-shaped has become endangered due to excessive picking by tourists and so it is almost extinct. 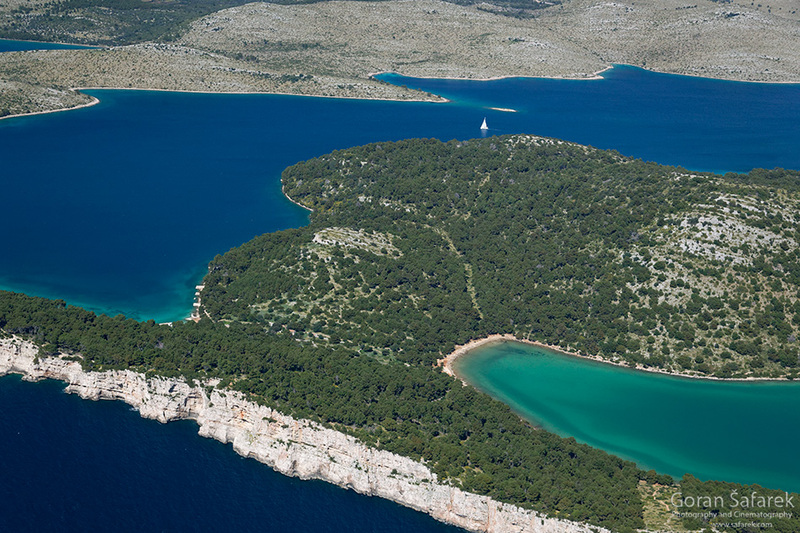 There is almost no shade from trees on the Island of Pag, except for camps where Aleppo pine trees are planted to make the tourists’ stay as pleasant as possible, although there is a natural downy oak forest growing in Dubrava. In this craggy environment without much shade, Eurasian stone curlews nest. This big- and goggle-eyed bird is one of the biggest waders. It keeps to open-space habitats, rocks, dry pastures, pebbled sandbanks, etc., feeding on invertebrates at dusk or at night. They then gather to pasture together, even during nesting, when lifelong mates raise their younglings in low vegetation. Eurasian stone curlews nest in the so-called mudflats of the Island of Pag. A bit further away from the shore, there are shallow and overgrown mudflats – Veliko Blato, Kolansko Blato and Malo Blato. In the midst of rockeries and the surrounding hills, flat and shallow wetlands have found their home at the bottom of karst fields with a fresh water source, real little oases surrounded by karst. There, the water is surrounded by bulrush offering more room for hideouts and nesting. They are of immense importance for exhausted and hungry migrant birds or wintering birds, and so it is not surprising that 168 species of birds have been spotted and recorded there. Veliko Blato (Large Mudflat) is a generous source of water and a lakelet, where the drinking water for the local communities is drawn from. Malo Blato (Little Mudflat) is brackish and dries up in the summer. Nevertheless, it is one of the most important nesting areas of Montagu’s harrier in Croatia, where some ten mates nest. Unlike most other species of birds of prey, this species nests on the ground. Harriers are typical open-space birds of prey. These long-tailed and long-winged predators catch their prey elegantly and swiftly in a soft and swaying flight, often just above the ground. When they spot their prey, they plunge for it and catch it by firmly clutching their sharp claws at the end of their relatively long legs. 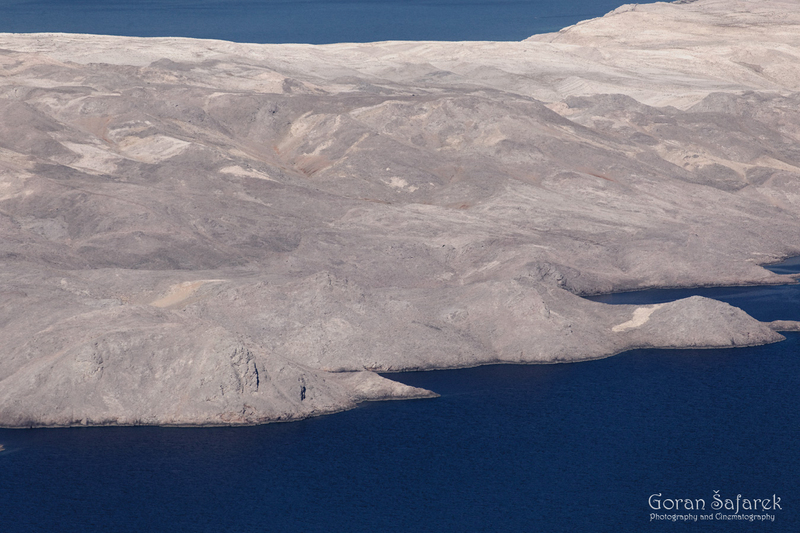 However, the Island of Pag is not just a pile of sharp and scorched rocks. In many places, it is easily crumbled given that it is sandstone and marl, which is why its beaches are mild and pebbly. 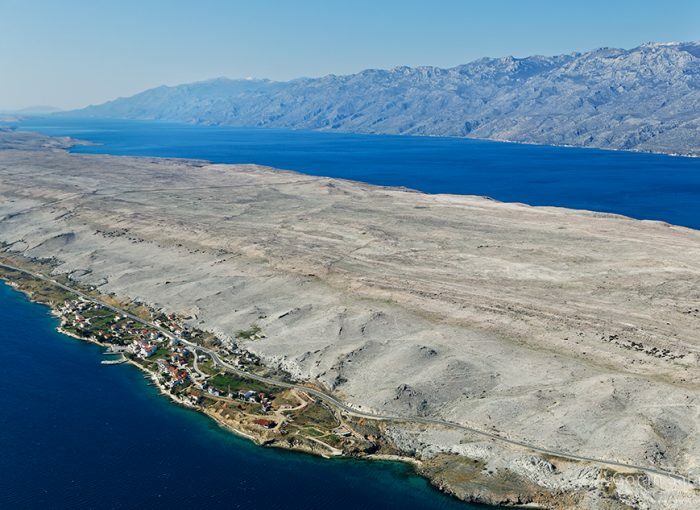 The Island of Pag is, with its distinguishing features, a natural whole with the more remote Ravni Kotari in the hinterland of the City of Zadar, first and foremost owing to their regular rows of limestone hills and plateaus intertwined with soft marl and sandstone valleys. Until 5-6 thousand years ago, this had all been a single strip of land, when the sea level had been lower for about as much as a hundred metres. With the rising of the sea, its vast valleys were partly submerged, and what remained are today’s Bay of Pag, the coves of Dinjiška and Vlašići and others, as well as vast mudflats (under the influence of both fresh and sea water). Pag is one of the many Dalmatian islands typically dominated by Eastern Adriatic karst. These shallow and vast valleys bathed in sunshine have been made good use of by people – for saltworks. For centuries, they have let seawater flood these saltwork basins so as to extract salt once the seawater evaporates after periods of sunbathing. Prior to the invention of coolers and refrigerators, salt was the only way to conserve fish. But these shallow basins are at the same time natural habitats, just like muddy shallow lagoons. 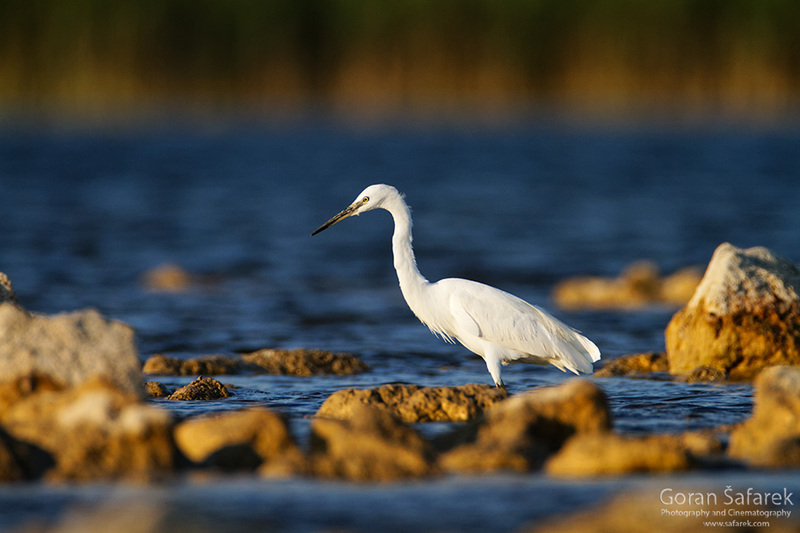 In a symbiosis with man, wetland birds nest around the saltwork basins, being able to find plenty of food around. Saltwork basins are particularly important for the Kentish plover, a rare nesting bird of Croatia’s. At the foot of ancient olive groves on the Peninsula of Lun near Novalja, the coast descends steeply into the sea. Although it is not protected as a nature park and in spite of constant fishing, the underwater world of the Island of Pag nevertheless offers many a colourful experience. Submarine steeps and greater depths here suit many organisms, most notably corals. The delicate yellow gorgonian with tens of tiny polyps filters the sea catching and eating smaller organisms. The holes in the rocks are shelter to the red scorpionfish, the spiny lobster, the European conger, the octopus and other less mobile organisms, such as the colourful sea snail and other camouflaged animals. The gilt-head bream and an abundance of other fish are preyed on by the common dentex, a fast and strong hunter, just like the greater amberjack, shoals of which are known to be seen swimming along the coast. The Island of Pag definitely deserves to be given special attention by lovers of the Croatian coast, given that the crag of Pag hides much more, many untouched natural treasures, interknitted with an equally rich cultural heritage into the unforgettable Pag lace in which man and nature are united. Pag is scorched island, with very little shade. Bring lots of sun cream and sun umbrellas. Zrće is very expensive, so bring lots of cash.